We may as well have been on Mars. Far away from any semblance of civilization and surrounded by a seemingly endless horizon of dramatic desert landscape, we had the place to ourselves. Is there anything so liberating as escaping the masses to quietly commune with nature in a vast expanse of stunningly beautiful desolate terrain? Granted, it was a Wednesday afternoon in the middle of July with temperatures soaring into the triple digits, but still. 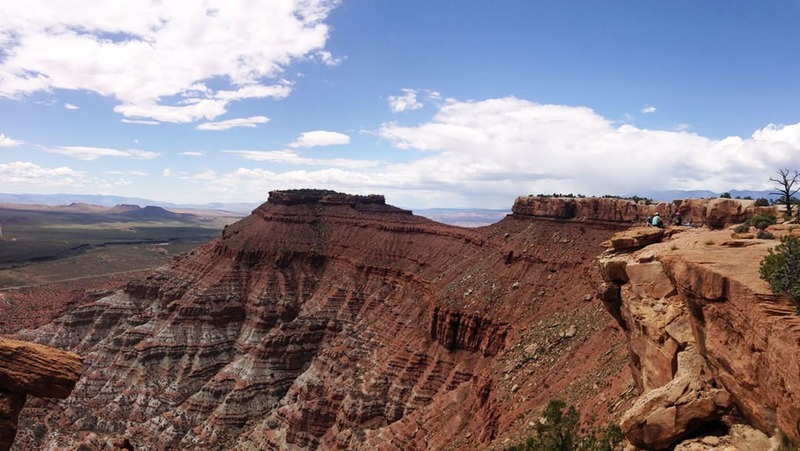 We were there to take a tour of the legendary Gooseberry Mesa mountain biking trail system near Hurricane, Utah. View from the North Rim Trail. Let's set our stage: Massive exposed shelves reveal 240 million years of erosion and a departed ocean that left shoreline deposits and formed the hardened Shinarump conglomerate, which formed the cap of Gooseberry Mesa. Rising further, the bygone forest left behind petrified wood, which can be found lying on the mesa surface. Wavy bands of red sandstone mold the Moenkopi Formation that experienced riders familiarly know as slickrock. Swirls of piñons and junipers pepper the trails, while California condors circle above. A cottontail rabbit darts across the path. We peer closely at the rock as we spin by to see the sunbathing lizards. Stop for a quiet rest, a deer might make an appearance. Mind the cacti. Crashing is even less fun if you land in the prickly Claret Cup Cactus. Crashing? It's possible. These trails are not for everyone, as most are considered intermediate to advanced level riding. This is a first-rate, looping trail system that allows for a variety of course options. 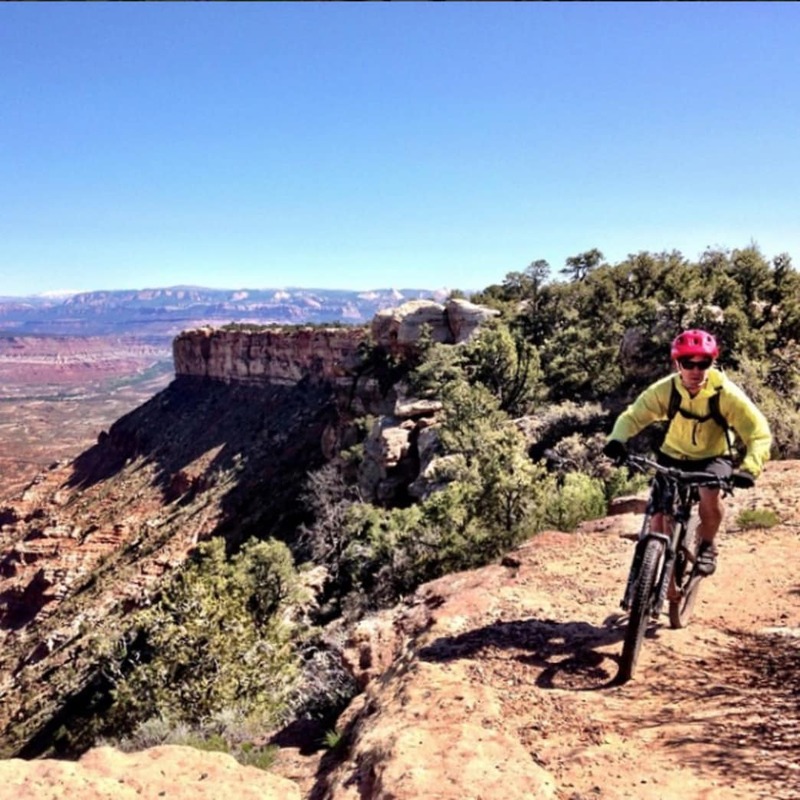 If you ride the entire Big Loop Trail counterclockwise, you'll complete just over 13 miles of intermediate and advanced technical riding connecting both the North Rim and South Rim sections. Alternatively, you can choose your own adventure by riding a combination of the trails to customize your mileage and difficulty preferences. Although both the Point and Overlook vantage points are out-and-back trails, they are absolutely worth the extra effort. The trails are marked fairly well and easy to follow in most places, but cairns can always be missed. Some of the routes are marked with white paint spots to designate the trail. However, because you can ride in either direction, it's important to use your navigational skills because it's too easy to get turned around and the trailscapes can start to look homogenous real quick if you get lost. View from the point, start of the South Rim trail. The summer's mid-day heat made each pedal rotation a little more work, but the cache of Gooseberry Mesa is that it features roller coaster slickrock singletrack grandeur in lieu of lengthy ascents and descents, allowing riders to whistle while they work. The South Rim and Hidden Canyon loop is considered advanced technical and inspires a few come-to-Jesus moments along the way. Good thing it's always an option to hop off your bike and walk the iffy sections that are close to the cliff side. The 1.8-mile North Rim is more suitable for intermediate riders and features short, steep climbs with no shortage of jaw-dropping vistas. If you're unsure of your ability, have a go at the moderate Practice Trail. It will give you a good idea of what's in store. It's also a great warm-up for the longer trails. Overall, no matter which trail you choose, Gooseberry Mesa is a classic trail that will reward you with epic views and darn good fun. Add it to your itinerary if you plan to ride in the area! Written by Melissa McGibbon for Utah Office of Tourism.